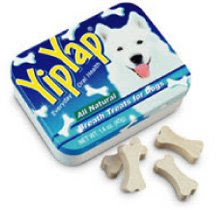 Does your dog enjoy YipYap Breath Treats? If so, the maker of Yip Yap, cHoMp, wants to know about it. If you send in an old, empty Yip Yap tin with a story, they'll send you a free replacement. Click here to claim your free box of Yip Yaps! Don't worry, cat lovers, cHoMp hasn't forgotten about you. The same deal applies for their fish-shaped Pit’r Pat treats. Free stuff and no more stinky dog breath? Not too shabby!